DI Politics Chat: Was the 2016 Election Legitimate? DI Politics Chat: Was Hillary Clinton Right to Question the Legitimacy of the 2016 Elections? 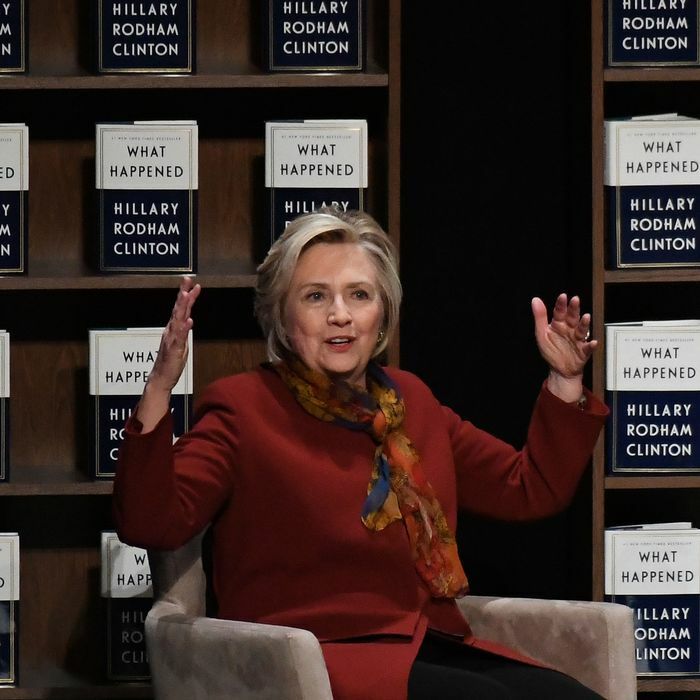 In an interview today, Hillary Clinton questioned the “legitimacy” of Donald Trump’s presidency, saying that she wanted an independent commission to “get to the bottom of what happened. Jonathan Chait, Ed Kilgore, Eric Levitz, and Ezekiel Kweku talked about whether Hillary Clinton was right, and what we talk about when we talk about legitimate elections. Ed: Maybe “much as I hate to say it, yes.” Much as I hate to say that. Jon: I agree. I don’t hate to say it that much, though. Eric: Agreed. Russia and James Comey exercised undue influence over its outcome. But well-heeled, influential actors of all sorts exert undue influence over every election’s outcome. Ezekiel: I don’t think the Electoral College poses a threat to the public’s faith in our nation’s democratic legitimacy though. I think the Electoral College is not the optimal system of deciding an election, but that’s a different question. Ed: Eric: Not sure “democratic legitimacy” is a thing. The Latin root of legitimacy is “legitmus,” which simply means “lawful.” I hate the Electoral College, personally. But calling it “illegitimate” makes no sense. Jon: The system is inherently deficient in its democratic legitimacy, but that’s not the way most people understand a “legitimate” election. Most U.S. presidential elections entailed massive disenfranchisement of women, African-Americans, or others. But they were “legitimate” if they followed the rules, counted the votes correctly, etc. Ed: The Electoral College’s constitutional function is to end all presidential-election disputes. That’s why its vote is certified by Congress. Eric: Democratic legitimacy is a real, academic term that’s used to describe a situation in which a public is confident that a putatively democratic system is genuinely democratic. Ed: Okay, I’ll take your word for it. But in the context of 2016, there’s no question “legitimacy” means “an outcome that should be accepted.” And I think HRC knows that. I should probably admit that I never took a political science course in college. One reason I love baiting political scientists. Ed: Yeah, I’m a “populist” in at least this one respect. Eric: America positions itself on the world stage (or at least, did until Trump’s election) as the leader of the free world/a global coalition of democracies. It has justified toppling foreign governments in the name of democratic ideals. And I think that claim is undermined (or delegitimized) when a minority of the population selects the U.S. president. Jon: I have decided my function here is just to vulgarize everybody’s perspective. Ezekiel: The minority of the population always selects the U.S. president. Ed: Certainly did back in the day. Eric: This is true. And certainly, increasing voter registration/participation is also extremely important. Ed: Trouble is, our anti-democratic constitutional system makes fixing its anti-democratic nature very difficult. Ezekiel: If we’re gonna get scientificallistical about it, then I should point out that Arrow’s Impossibility Theorem proves out that there’s no system of voting that can represent group preferences consistently. Which is to say that there is no perfectly democratic system, even in theory. So the question is whether we’re passing some threshold level of fairness. I think we are. Ed: I have a related bone to pick with Eric’s original formulation about “legitimacy” depending on “the public” being confident in election outcomes. Which public? The public that cheers Trump’s claims he won by a landslide? This is a pet peeve of mine, BTW: assertions about what “the public” or “America” believes. Eric: The public as a whole. Beyond the laws, the idea that elections should be determined by who receives the most votes is a pretty fundamental normative concept in this country. I think if Clinton had won 70 percent of the popular vote last November, and Trump became president, then the *already significant* crisis of faith in the fairness of our system of government would be severely exacerbated. I think that fact that she won 2 million more votes and he became the president modestly exacerbated it. Ed: What percentage of the population really understands the Electoral College? Eric: Excuse me, 3 million. Jon: Not that I’m bitter. Ezekiel: I think the fact that Clinton won 3 million more votes and lost is less an indictment of the electoral system than it is of Clinton’s campaign. But that’s an aside. Eric: Like I said, I think that Clinton should have affirmed the legitimacy of the election results. I’m just saying — if she felt compelled to voice some bitterness/defend her ego — I think it would have been fine for her to have transitioned into an argument about how our democracy must be strengthened in a variety of ways, including through the abolition of the Electoral College. Ed: The practical way to get rid of the Electoral College is via an interstate compact. That could be a Democratic campaign promise in state elections. Jon: Disagree, Eric. I think it makes sense to disaggregate those arguments from complaints by the election’s loser. Jon: Well, the design of the election system we have, with winner-take all voting and the possibility of spoilers, allows at least in theory for some hugely perverse outcomes. Ed: Jon raises an interesting point. On the one hand, you might say no one has more standing to complain about electoral irregularities (or the Electoral College) than Hillary Clinton. But on the other hand, half the country will dismiss anything she says out of hand. Jon: What if the winning candidate lost not by 2 percent but 10 percent? Or more? It could happen? Ezekiel: It is obvious that a ranked-choice voting system, for instance, would be better than our current system. It’d also be better than a hypothetical system in which the popular vote winner won the election. But does that make an unranked popular vote system “unfair?” Not to me. Ed: And so far as I know, a ranked-choice voting system is compatible with the constitution. Ezekiel: Should also point out that there’s no such thing as “the popular vote” in any real sense. The current thing we call “the popular vote” is just an artifact of the current system — if elections were decided by a popular vote, the campaigns would have been run differently and voting patterns would have changed. Ed: Another issue with our system that is germane to “legitimacy” and “sore loser” concerns is the impossibility of coalition governments. You win the presidency, you get control of the entire federal government, the armed forces, etc. In 2000, which really did skirt the limits of the system (outcome basically determined by SCOTUS) there were calls for a coalition cabinet. Bush ignored it all, other than bruiting about the idea of an oil-state Democrat at Energy. Eric: I think Ezekiel’s points about shifting voting patterns under a popular-vote system — and his one about the Clinton campaign — are true to an extent. But I don’t buy them totally. Our politics is sharply divided along demographic lines. And we’re talking about a difference of 3 million votes. Ed: Getting back to the original topic, what good does HRC challenging the “legitimacy” of her loss do? Stiffen the “resistance?” We’re not going to abolish the Electoral College between now and 2020. Ezekiel: It is now On The Record As A Matter of Discourse. Eric: But do think that, under the democratic norms that most Americans intuitively accept, Clinton deserved to win. And if she wanted to say that — after stipulating that the election was fair and legal — I wouldn’t begrudge her. Ezekiel: I go back to the quote from The Social Network which has stuck in my head for whatever reason. When Zuckerberg tells the guys who are suing him for supposedly stealing Facebook.